Less than a kilometer away from Chavakad there is an ancient trade town Palur, currently known as Palayoor. Well known for its Christian pilgrimage center, Palayoor St. Thomas church. Renovated Church, Thalikakulam, Boatkulam and newly constructed museum are major attractions. Tradition says St.Thomas the apostle came to Palur, in 52 AD. He constructed a small wooden church. The museum holds a rock foundation stone structure and few more stones which was found near the Thalikakulam, is believed to be the remaining of the church built by the apostle. 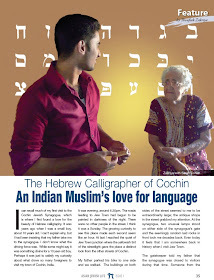 It is evident from Jewish Malayalam folksongs that this lost Jewish settlement was of some great significance, it is one of the frequent names in the song, which reveals that the first Jews arrived in Palur, and they later fled to Cranganore. This view is strengthening from another version, i.e. from Ruby Daniel’s translation of the same song in English. Disposed of all the wares brought. These songs give a hint that this community was never a long standing community and had moved to some other place and took their abode. Jewish tradition say that chieftain of Palur was not favorably inclined to them because a Jewish girl of bewitching beauty had rejected his amorous advances3.1. So they have moved to Cranganore (as mentioned in Song of Mala synagogue). Still controversy exists, have they moved to Cranganore or Chennamangalam or any other place? 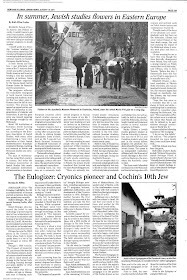 But Palur synagogue is not counted among the list of existing community/synagogue in “Toldot Yehude Kutzin” by Abraham Ben Yahya Saraf Ha Levi dated 1781 AD, or even in Samuel’s Hebrew letter “History of the Jews in land of Malabar”, dated 1790 AD. But Moses Pereyra de Paiva in his “Notisias dos Judeos de Cochim” dated 1685 AD, It is mentioned that Palur has one synagogue and 10 well to do family. 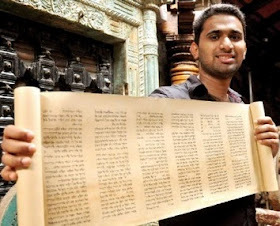 "This is the Torah finial (possession) of the synagogue of Palu (Palur), the year 5325 (1565)"
After a long drive we reached there, from the St. Thomas Church official we came to know about Jose Chittilapalli, a local historian. He gave details about the “St. Thomas Jew hill monument, Palayur” which was built a decade back. 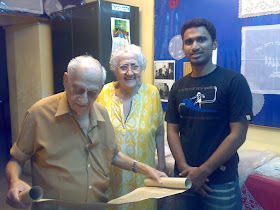 Interview with him and few localites had given more valuable points that had helped us to find out more about the Palur synagogue. He had thrown light on the location of the synagogue. 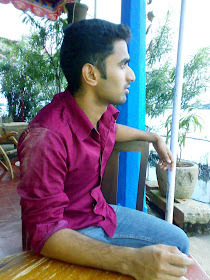 ** (The word അറിവെൻ aṟiven, is analyzed further. Could make sense than പാലൂർ കടൽ അറിവെൻ പനംകുറ്റിമരങ്ങൾ കണ്ടെൻ. *** പൊറൊത്തികാർ is translated as Porothi land by Prof. P.M Jussay were he doubts it is Persian. Portuguese in the commentary in Karkuzhali. 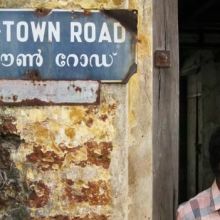 It could be even simply as പൊറുതികാർ - which could be roughly translated as the “dwellers”. 8. Adv. Prem Doss Yehudi, The shingly Hebrews, Page 104. There is some problem with location of Palayur as the Jew Hills. In fact, there is another ancient Church at Aarthat between Guruvayur and Kunnamkulam which is believed to have been located on the Jew Hills. Perhaps one should look for remnants of the synagogue/jewish settlements in and around Aarthat rather than at Paalayur. 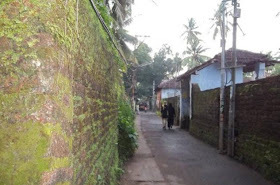 Palur has a very important place in the history of Jews of Malabar, it is one among the main four early Jewish settlement (ie Cranganore, Pullut, Palur and Madai). And appear in many of the songs with greater significance as mentioned above. So we cannot deny that there existed no Jewish settlement/ synagogue in present day Palur. • The Arthat St. Mary’s Orthodox Syrian Church is believed to be the pioneer Christian Community/church founded by St.Thomas in the first century A.D, the Palur St. Thomas Syro-Malabar Catholic church, identified wrongly, as some historians conclude, that the original town Palur is present day Arthat and it is the St. Mary’s Orthodox Syrian Church which was established by St.Thomas, which are existing on a distance of roughly 7-8 kms. • The present Palur village is on the sea level, and during the formative years of Christian era, it was believed to be, under the sea. The nearness to the sea, the sandy soil, and the presence of oceanic fossils also bear witness to this fact. But Arthat is the first high land from the sea level in the Palur region, which was known as Jewish Hill or ‘Juda Kunnu’. The claim of the present day Arthat being ancient Palur could not be neglected. If it is backed by geographical evidence we could consider it as a fact without any historical evidences. But is the ancient church exists on a Jew hill?? Here we can co-relate two lines..
2. One of the scrolls of Torah kept in the synagogue at Parur could have originally belonged to this (ancient Palur) synagogue. 1. the ruins of the synagogue what Mr. Elias Mordecai saw in Kunnumkulam would be of the ancient synagogue of Arthat (Ancient Palur) and the striking link of the Torah of Palur synagogue (mentioned by Prof. Jussay) and Rimon of Palur synagogue (mentioned by Ruby Daniel) and those ending up in Parur synagogue is again giving some clues. 2. The present day Palur and Jew hill monument would have been built on the Palur synagogue built by Ezekiel Rahabi. These facts/ fictions mentioned above need more research and studies, and your valuable feedback. Yes i ve been to Palayur and the place just west of the church is still called Jew Hill. Interesting exposition with songs and ballads. 2)According to this same manuscript it was copied in June 1301 in the church of Mar Quriaqos in Chingly. Now i heard only about one church that is dedicated to Quriakos before 1500 and its Paloor. Two of the ancient Syrian Manuscript preserved in Vatican with its code name “MS Vatican Syriac 22 & MS Vatican Syriac 17” are considered as of Indian origin. Only MS Vatican Syriac 22, is our subject. According to Bishop Francis Roz (1604 AD) who succeeded Mar Abraham, based on a Chaldean book he has read, there were three Churches in Cranganore. One was dedicated to the Apostle Thomas, another one to Saint Kuriakose, and the third one was dedicated to Our Lady. 1. We are not sure about the geological boundaries of ancient Shingly/ Cranganore. Palur/Palayur wound have been a part of Shingly/ Cranganore in then existed scenario. 2. There was only about one church that was dedicated to Mar Quriakos/ St. Kuriakose before 1500 and its Palur/ Palayur. 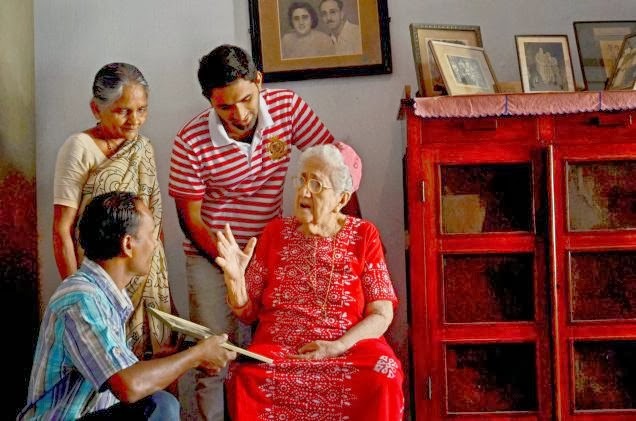 So reading everything together, MS Vatican Syriac 22 was written from an ancient Church dedicated to St. Kuriakose, which is located in Shingly/ Cranganore. Considering the above mentioned facts we may have to conclude that the St. Thomas Syro-Malabar Catholic Church in Palur/ Palayur dedicated to St.Kuriakose is “the church of Mar Quriaqos in Chingly” from where the manuscript was scribed.